This coin honors the outstanding service of the members of the AFCA, as they continue to develop innovative tools to strengthen America's Air Force. Minted in a brass alloy, this distinctive coin contains rich enamels on its obverse and reverse sides. 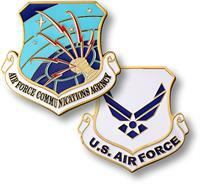 The obverse contains the seal of the Air Force Communications Agency. The reverse bears the official emblem of the United States Air Force. Each coin comes packaged with a detailed header card that describes the mission and history of the Air Force Communications Agency.